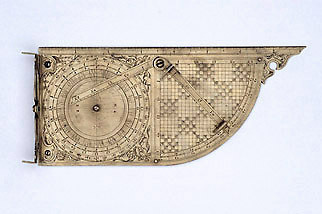 The surveying instrument has on one side a pair of sights, moveable in the vertical plane, on a decorated arm. On the same side is a wind rose with three concentric divisions; the first is 1 to 12, 1 to 12, the second is 1 to 24, the third is in 360? by 2?. A further inner scale is divided in transversals. The spandrels are decorated with fruits and flowers. Next to the wind rose is a pair of two calibrated rules from  to  by 5, one of which is equipped with sights. They can both move over a quadrant of degrees divided  to 25 by 1 to 5, and on the limb divided 0 to 90 in both directions. Within the quadrant is a sine and cosine diagram. Next to the edge of the instrument is a graduation  to 9 by 1. On the other side is the signature 'TOBIAS VOLCKMER BRAVNSWEIGENSIS ? SERENI: DVCIS BAVARORVM &c: Mathe: & aurifaber faciebat ? anno 1612'. Below it is a comparative table entitled 'HALBER WERCKSCVECH ETLICHER STEDTE' ('half foot of a few cities'), showing the inches of the foot-measures of Strasbourg, Munich and Brunswick (indicated 'MVNCHEN & BRAVNAV'), Nuremberg ('NVRNBERG'), Salzburg ('SALTZBVRG'), Regensburg and Augsburg ('REGENSPVRG & AVGSPVRG'), Vienna ('WIEN'), Landshut ('LANDSHVT'), Paris, Venice and Innsbruck ('PARIS ET VENETIA ET INSPRVK').